This is again an issue I get to see in many client places where the users complain they see the Send to Mail Recipient(PDF) grayed out. If Adobe Acrobat writer is installed and the same is still grayed out on all workstations, the resolution is already outlined in KB Article 852539. However, If the Adobe Acrobat writer is not installed and a different PDF writer like BCL EasyPDF , the Send To: Mail Recipient (PDF) grays out because this option works only when Adobe Acrobat writer is installed and Dexterity won’t entertain any other PDF writer except Adobe. One thing that is noteworthy is Printing to PDF still works with any PDF writer be it Adobe, BCL EasyPDF and so on. 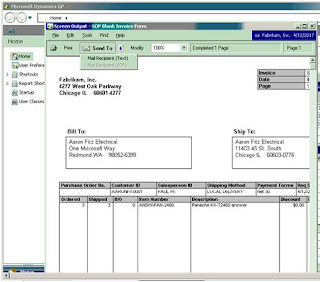 Instead of printing the invoice , Statement of Account how can I directly email it to my customer ? Or is it possible to mail any report as attachment ? I thought I’d touch on two questions regarding PDF’ing documents from Dynamics that we field quite often from clients. Do I really need that expensive Adobe product to make PDF documents from Dynamics? How do I send PDF invoices to multiple customers? Do I really need Adobe? To print a PDF ‘from Dynamics’ you will need the Adobe distiller loaded on the client which will then enable the ‘Adobe PDF File’ selection in the report destination window. Simple enough, and it works with little or no additional effort (be sure you turn off ‘send soft fonts to printer’ in your Adobe setup). But do you really need Adobe to print your PDF documents? Not at all, and in fact from a maintenance standpoint (see the above comment on the soft font issue) I think it’s easier to use a product like Cute PDF. You simply set the default printer to the PDF printer and use the printer interface to create your documents. Effective and inexpensive and quite easily managed with just a little training.